I am very happy and excited to post my 100th recipe today. I really enjoyed my last few months of blogging. My sincere thanks to all of you, for your support and encouragement. Please continue to visit my blog and leave your valuable comments.. I also would like to thank my family for supporting me during the last few months of blogging.. In a bowl, mix plain flour with cocoa powder, baking soda and baking powder. Sieve it and keep it aside. In another bowl, take sugar and add eggs, oil and milk and beat together until sugar dissolves. Add dry ingredients (step 1) to this and mix well. Pour this chocolate cake batter in to greased 9" baking pan. Bake at 190 degree celcius for 30- 40 minutes or until the toothpick/ skewers inserted in the middle of the cake comes out clean. Leave it in the pan for 5 minutes and then turn the cake over to a wire rack to cool completely. In a mixing bowl, place heavy whipping cream. To this add icing sugar and vanilla essence and whip until soft peaks are formed. For garnshing, take any chocolate bar and peel or grate it using a peeler. After the cake cools down, remove its top crust and then divide into 3 equal layers. Sprinkle cherry syrup or sugar syrup on all the chocolate cakes. Place one layer of chocolate cake on a serving plate/ cake stand and add a layer of whipped cream and spread it all around. Place another layer of cake and spread out one more layer of whipped cream. Now place the final layer of cake and gently press down. Spread the remaining whipped cream on top and all over the cake. Congrats on the 100th post!! Yummy cake.This is my favorite..
congrats on your 100th post.......this is really yummy! 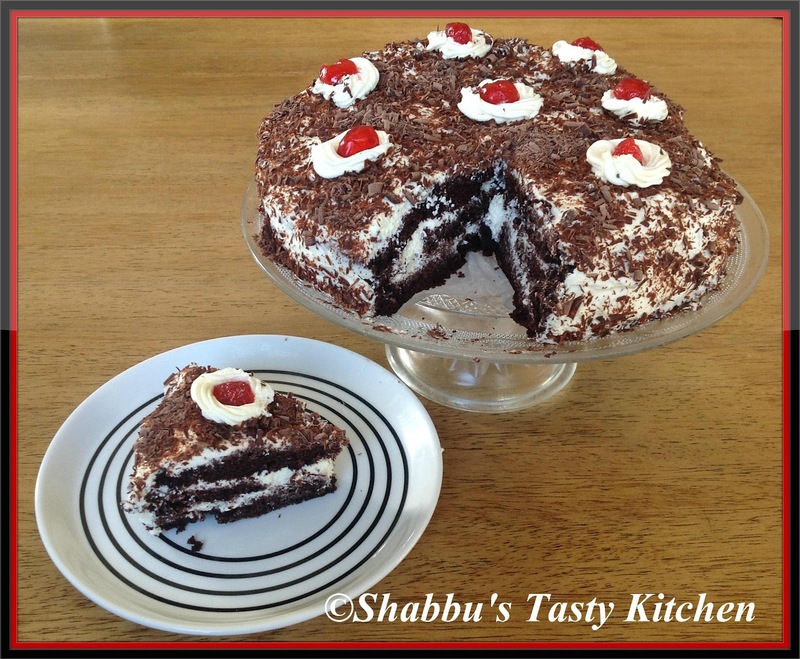 Many congrats on your 100th post Shabbu..Your black forest looks so tempting and moist that I feel to have few slices..ha,Yum! can I have a bite ?? Congrats Shabna on your 100th post. Cake looks yummy :). Black forest is my favorite.. Expecting entries from you for my Independence day event !!.. Congrats shabbu, thanks a ton for the visit and for the follow. OMG! the cake looks YUMMY...wish I could just sink in...happy to follow u too dear..keep visiting...lovely space u have here. Congrats dear. A perfect cake to celebrate. Yummy! Congrats on your 100th post. 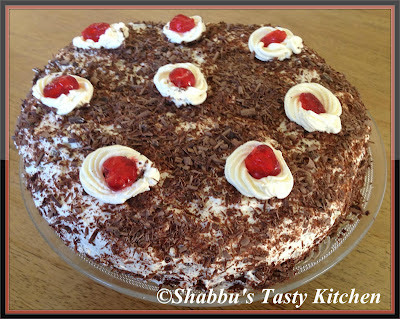 My favourite black forest cake, looks awesome dear. Congratulations on the 100th post. And what a lovely cake to feature too. Perfect way to celebrate,gorgeous cake. Congrats on 100th post, delicious and perfect cake. Congrats on your milestone,wishing many more milestones..yummy,my favorite cake!! Congrats dear and wishing you many milestones..cake looks so tempting. congrates .. lovley delicious cake .